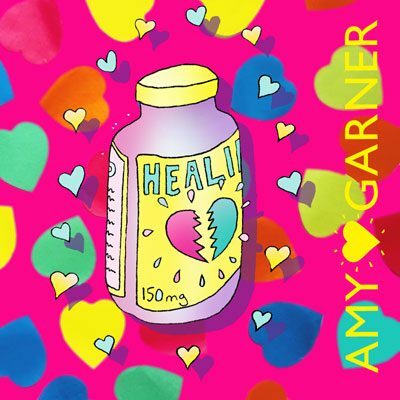 Heal a broken heart – How to | A spiritual guide to recovering from broken heart by Amy Garner. Writing this blog post on how to heal a broken heart put me in touch with the painful emotions related to moving on when we don’t want to. Essentially, when we feel rejected, devalued, hurt or betrayed by another person. Though a broken heart is unpleasant on many levels, the subsequent healing has the power to be deeply transformative. Conversely, we come through such a severe disappointment with a much stronger relationship with ourselves. This re-discovery of our essential being often prompts a blossoming. During recovery, the pain (often experienced physically around the heart chakra) is an ever-present reminder to keep our energies firmly on our own development and care. This shift in focus can be immensely liberating, as well as frightening, as we let what we love slip away. Ultimately, we reach a point of neutrality, where the once impossible becomes effortless. We are able to bless the other person – and the experience – while letting them go completely. The act of forgiveness is an everyday miracle. It cannot be rushed or forced, but is as inevitable as day follows night. Note: All the steps discussed below can also apply, and be equally effective to recover from, any situation where you have felt devalued, disrespected or betrayed by someone whom you loved and trusted, not just romantic love. See also Relationship Cord Cutting and How to find my soul mate? It is likely that in the early stages of realising that you need to heal a broken heart, you are still in shock. The picture you had in your mind of the person you thought you knew, and the relationship you thought you had, has been shattered. The effects of shock can include loss of appetite, sleeplessness (or a need to sleep a lot), withdrawal from daily life, emotional vulnerability, tearfulness and physical sensations. Your mind may play over events again and again, trying to make sense of what has happened. This period of processing can include questioning: what did I do wrong? Did that person intend to hurt me? Did they ever love me? What to do: If you are experiencing strong or overwhelming emotions, you can use self-help tools such Emotional Freedom Technique (EFT, also known as tapping) to take the edge off the worst of it. Sit quietly and let your mind wander, while you go through the tapping sequence [here]. Tap until you feel relief. You can also use Bach’s Rescue Remedy to help you feel calm enough to cope with everyday life. Drink comomile tea and eat calming foods such as onions and oats, plus wholegrains, fresh fruit and vegetables, and foods rich in Vitamin C for all-over healing. What not to do: Because your adrenals may be working in overdrive, try to avoid stimulants like tea, coffee, sugar and alcohol. Do not look for comfort in the arms of the person who hurt you: this merely delays the inevitable and means the healing process will take longer. In order to move past feelings of powerlessness, you need to regain a sense of trust – in yourself and in life. It’s vital therefore not to aggravate the wound you are trying to heal by continued exposure to the person you are feeling hurt by. In the short term this may involve setting limits on communication and contact. Limiting exposure can be difficult when the person is a work colleague, friend of a friend, family member, part of your local community or when you still live under the same roof. In these cases, you need to create a safe space where you are not facing constant reminder of what was/might have been. When you cut yourself off from someone that is causing you pain, there is a difference between an act of hostility and an action for self-preservation. The intention here is to give you the necessary space to recuperate from a challenging situation that is compromising your wellbeing. What to do: Remove photos from your wall/desk/phone/computer etc. and store other reminders of your shared past out of sight or throw them away. Excuse yourself from social engagements where the other person may be present. You may decide to unfriend, unfollow, block or delete relevant contact details [is there an app for this? ], at least until you are feeling more bouyant, if not permanently. What not to do: Don’t try to be friends too soon. The terms of the relationship changed (against your wishes) and you need time to adjust. Though there may be a friendship to salvage, your primary task is to take care of you – not to make the other person feel better or for you to feel less guilty. The person you loved may not be committed to you, but YOU can still be committed to you. One of the silver-linings of a broken heart can be that all the time and energy you put into the relationship with the other person, can now be focussed entirely on your relationship with yourself. The time it takes to heal a broken heart can be a time of personal rediscovery. It’s an opportunity to devote yourself to self-improvement, self-care and self-healing. You have freedom to imagine and create any kind of new life you want to have. It’s a time to respect, love and care for yourself in a way that the other person didn’t. So, make a commitment to yourself and start doing this today. What to do: Do things that make you feel good. Exercise, be outside. Get a haircut, massage or new clothes. Book that holiday you’ve been postponing. Read inspiring books or watch films about strong people who healed their broken heart (for example, Wild by Cheryl Strayed which is now a film with Reese Witherpoon on Netflix). Do something unusual or daring. What not to do: Run yourself down, punish yourself, blame yourself or indulge in any other form of poor treatment of self. Pay attention to negative self talk and turn it off. Strong emotions between two people create relationship cords. Energetic bonds created in this way can be positive or negative. The feedback you get from your relationship cords might make you feel uplifted, depleted or even blocked. Relationship cords can exist even if you are no longer physically or geographically close to a person. A person may be still on your mind or in your heart. You may even feel someone still has a hold over you or that you have a strong attachment to a past relationship for a unusually long time after it has ended. Why? Unconsciously you may be still connected through a relationship cord or cords on a hidden level. It’s a good idea to learn how to cut energetic cords with people you’ve felt a strong connection with. This can be done with love so that it is an act of healing for both parties. What to do: Listen to, learn about and practice the Relationship Cord Cutting. What not to do: Convince yourself that it’s better to remain connected energetically – even in unhealthy ways – when it’s not for the highest good. One of the most difficult aspects of healing a broken heart can be the lack of closure. The other person is no longer available to confide in or be supported by. In fact, the person who once understood you the most is now a distant stranger. The situation can feel very unfair. You may feel a storm of emotions as you go through the five stages of grief (anger, sadness/depression, denial, bargaining and acceptance). To help you release this situation and move on, it can be useful to write. Scribble down your thoughts and feelings on an A4 pad until there is nothing left to come out. This may take a few goes. You can write your feelings out in the form of a letter or rant. Handwriting is preferred because this is a more effective way to connect with the subconscious than typing. Don’t worry if what you write seems random, nonsensical or stupid. Your pain and perspective really is better out and than in. This exercise will help bring you closure and peace when it is not possible to find it with the other person. What to do: Express yourself full on paper, audio or physically (i.e. dancing madly, screaming or beating a pillow). The intention is to get all of your emotions out in the open in a safe way. What not to do: Send the letter/email; show your ramblings to others; or scream, abuse or act-out to the other person. Your system is assimilating shock and you may feel physical sensations, especially pain around the heart chakra. Energy healing can help tremendously with recovery on all levels (mental, physical, emotional and spiritual). I have found Theta Healing to be extremely effective when dealing with clients who are healing a boken heart [directory of Theta healers]. Less directive than theta healing is Reiki healing which is also very good for regaining balance, inner peace and soothing pain [directory of reiki healers]. The act of working with an energy healing practitioner alone can be very comforting, aside from the healing itself which can shift feelings of stuckness, depression and pain. What to do: Research compassionate and experienced healers who charge reasonable rates. Consider booking several appointments, instead of only one, so that you have time to gauge the healing over a number of weeks. What not to do: Don’t expect a healer to wave a magic wand in one session. Though positive results can be achieved, it’s unfair to put them on trial or get frustrated when you are not completely healed after 60 minutes. Even the best healers are not miracle workers. Being a spiritual person, you may already know the importance of forgiveness in terms of moving on. Yet, often people rush to try to forgive before they are truly ready. Intellectually you may have reached a point where you know that, until you forgive yourself and them, you are still energetically tied to that person. It is necessary to move through all the 5 stages of grieving before forgiveness can be reached. Unfortunately, this comes in it’s own time. You must be patient with yourself and accept when you are not ready to let go completely. When you have done what you can in terms of the above steps, it’s normal and natural for the rest of recovery to be dependant on a factor that is outside of our control: time. Therefore, don’t expect too much of yourself. It’s likely you’ll have good days and bad days. Think of this last stage as a long game. Know that you will reach a point in future where you are able to look back on this experience with complete peace and composure. You will be able to sincerely bless this person before letting them go with love. You are not there yet, and that’s completely okay. What to do: Give yourself a break. Stop focussing on others and bring your focus back to you and what you like doing. Practice self-acceptance and keep any negative self-talk in-check. What not to do: Become impatient with the way your are still feeling; assume there must be something wrong with you / your feelings. Try to force yourself to feel or act a certain way before you are ready. ​​A meditation to sooth a ​hurting heart ​that has closed to protect itself from pain. Advanced and basic techniques.